The Walk Arcade is one of those many ordinary and easily forgotten arcades and lanes in Melbourne. Strategically connecting the ever-so-happening Bourke Street Mall and the quirky Little Collins Street, the Walk Arcade, with its simple and unassuming façade, lacks the essential historical significance, glamorous architectural design or any artsy aura to distinguish itself from its numerous other rivals. 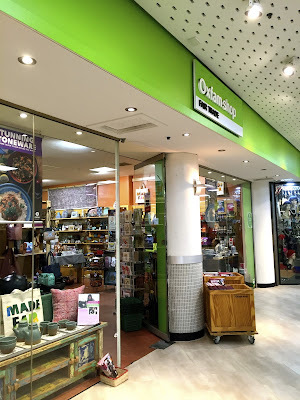 Yet hidden within this Plain Jane of the arcade world is the Oxfam Shop, a beautiful store with a beautiful vision to fight against poverty and injustice. We could of course simplify the shopping process and make it an emotionless, conscious exercise of judgment based on price, quality and workmanship of the products. Most of us will still be walking out from the store smiling from ear to ear, having thoroughly enjoyed a spectacular shopping experience at this very special store. After all, who doesn't love the fluffy feel of a daintily handcrafted, 100% alpaca wool throw specifically delivered from the exotic, mountain range of Andes in Southern Peru; Or how about an exclusively designed and hand-painted bright red, oval serving ceramic platter with delicate rooster motif produced in Colombia? On the other spectrum of extreme, we could look beyond the surface of each item, and explore the unique stories behind the products displayed on the shelves and found on its website, and be part of the movement to bring about a positive change and make a difference to some of those not so fortunate people in the world. We can pick up that beautifully embossed bronze flower earrings, discover the importance of Spondylus to the Andean cultures, and learn more about how the Manos Amagas Fair Trade organization in Peru turned an offering to the goddess of earth into elegant jewelleries. We can also marvel at how an artillery shell casing can be so gracefully turned into a pair of delicately crafted doves of peace earrings, and be reminded of the dark and horrifying Pol Pot genocidal regime that massacred almost a quarter of Cambodia’s population just a few decades ago. The Oxfam shop is the place where we can purchase authentic handcrafted copper curry bowl, with the certainty that the workers in India are receiving their due wages and be treated with respect. This is the place where best quality coffee from East Timor and highly graded chocolate from Dominican Republic can be found, all tagged with the label of fair trade. The Batsiranai Mother and Baby Doll is not just a pretty doll with fancy dress style; it is a symbol of hope to the mothers with handicapped children in Zimbabwe, and an assurance of a secure future to the vulnerable and disabled African kids. Shopping in Oxfam changes our role from a mere consumer to a silent activist fighting for fair wages and better future for the workers in marginalized economies. Buying a cute little greeting card for $7.95 or a miniature wooden giraffe magnet for $4.95 can never be so meaningful, knowing that part of the proceeds will eventually be used to create a better life for an individual somewhere in the corner of this world, be it a young Javanese in Indonesia striving to make ends meet, or an unemployed from the Upper Egyptian town of Mallaw.